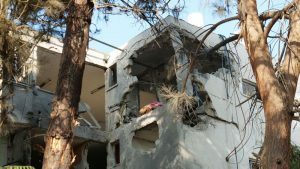 ASHKELON, Israel – Hamas and other Palestinian terrorist groups accepted an Egyptian-brokered cease-fire with Israel on Tuesday, right after terrorizing Israeli civilians with hundreds of rockets attacks launched into Israel over a 24-hour period. The photo is from an apartment complex, hit by rockets, in Ashkelon. Israel had responded with airstrikes, but the Israeli response may not be over yet. There was no immediate word from Israel on whether it had accepted a deal. Israeli Prime Minister Benjamin Netanyahu met with his Security Cabinet Tuesday to decide how to respond to the biggest single day of rocket attacks from Gaza ever. The unprecedented barrage has brought the Jewish state to a knife’s edge between a ceasefire and war. Air raid sirens and explosions tormented southern Israel with the sounds of war on Monday. Terrorists in the Gaza Strip launched some 400 rockets, mortars and missiles at Israel. The Iron Dome Anti-Missile batteries struck down about 100. Some fell inside populated areas. The IDF responded to the barrages by attacking some 150 Hamas and Palestinian Islamic Jihad military targets in Gaza, including a Hamas television station and governmental structures. Hamas and Islamic Jihad claim the rocket fire was revenge for an Israeli intelligence-gathering incursion that they say went awry several days ago.